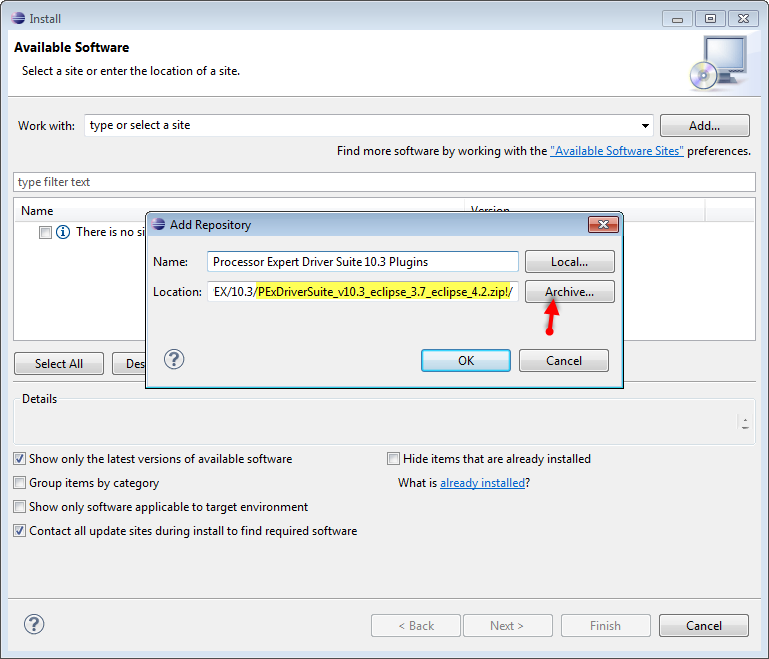 If you have the Processor Expert Driver Suite not yet installed, now it would be the time to download the 10.3 Eclipse plug-in version as outlined in this post. Then go through the installation process, with a need to restart Eclipse at the end. 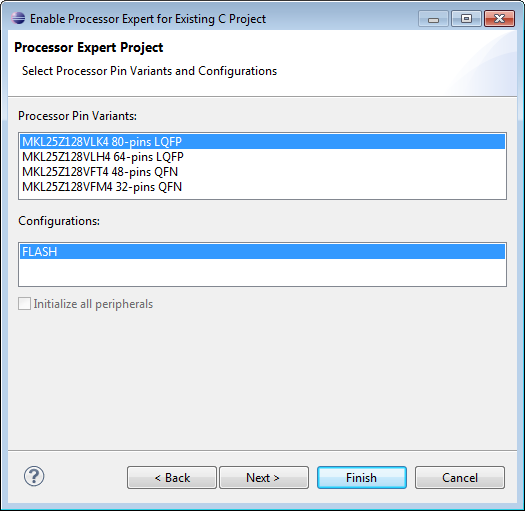 In “Part 7: GNU ARM Eclipse Plugins” I created a non-Processor Expert project. 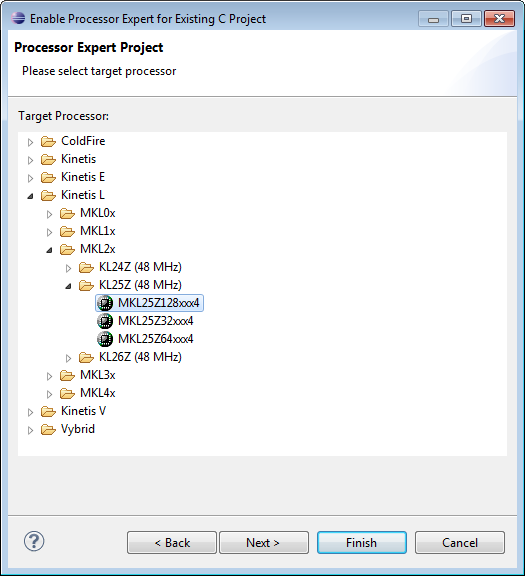 With the latest release of the GNU ARM Eclipse plugins it is now possible to use a Processor Expert project. 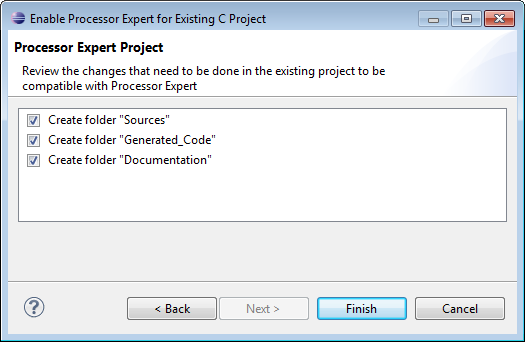 💡 Processor Expert projects under the Driver Suite do not set up a proper tool chain, at least not up to V10.3. The projects created are more like ’empty tool chain projects’, and the projects are ‘wrapped around’ e.g. with IAR or Keil projects. 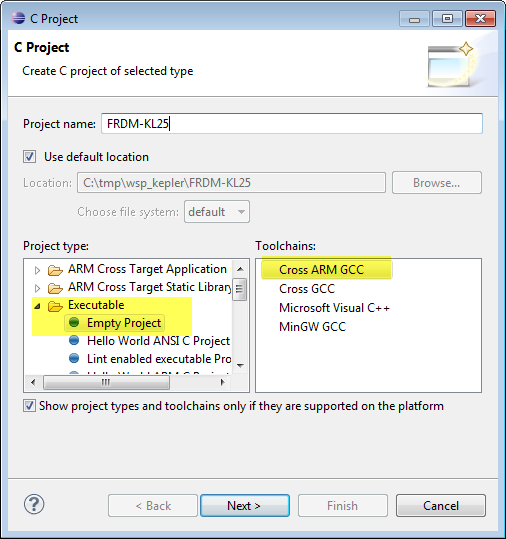 It would be possible to create an ’empty’ project with Processor Expert and then configure the GNU ARM Eclipse tool chain for it. I tried that, and that seems to work. Well, almost. I was running into subtle issues (‘print size’ or ‘generate s19’ not working properly, ‘clean’ not working. It looks like the project set up by Processor Expert is really not good. 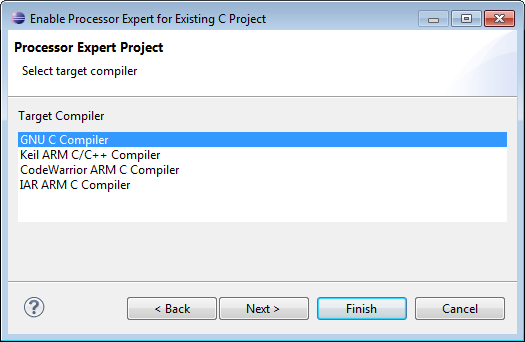 Instead, I’m going the other way: creating an empty GNU ARM Eclipse project, and then change it for Processor Expert. I’m using an example for the Freescale FRDM-KL25Z board (ARM Cortex-M0+ core), but the steps are very similar for any other microcontroller. Now I need to change some of the project settings. Next I select the C/C++ Build settings (menu Project > Properties). 💡 I can copy-paste paths from the clipboard or from other projects. 💡 Note that I’m using ‘../directory’ notation, and not using an Eclipse variable. The reason is that I want to have the directory name as short as possible. 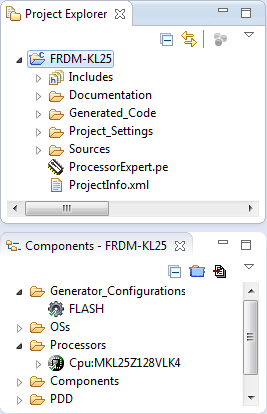 The path is relative to the output (object files/etc) folder which is the ‘FLASH’ subdirectory I have used as Build Configuration name. For the linker I need to specify the linker script file. With this, the build tool part should be complete, and the project should compile as usual. 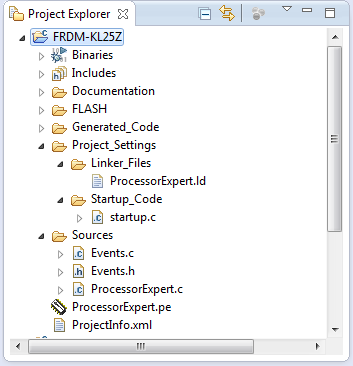 And I can add Processor Expert component, generate code as usual. What is missing so far are the settings for the debugger: they stay the same as outlined in “Part 7: GNU ARM Eclipse Plugins“, so not necessary to repeat this here again :-). With Eclipse, ARM GNU gcc+gdb, GNU ARM Eclipse plugins and Processor Expert a have a very powerful tool chain. It requires some little plumbing, but the reward is a state of the art tool chain which is not only fast, but powerful and very extensible too. And the advantage of the plumbing is that I have control and knowledge about what is going on behind the scenes :-). 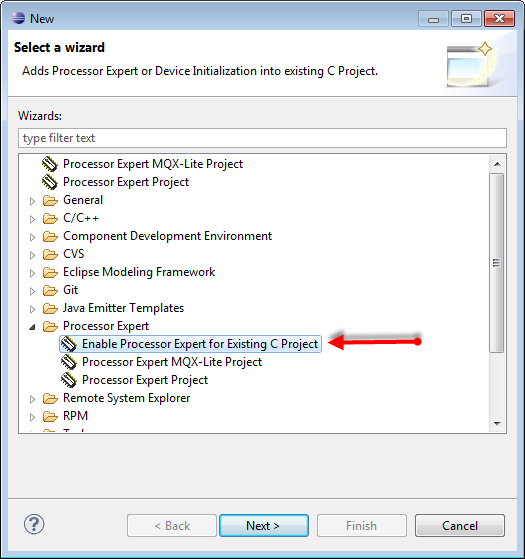 This entry was posted in Eclipse, Embedded, Processor Expert, Tips & Tricks and tagged arm gcc, Assembly, Building, Eclipse, gnu gcc, open source projects, Processor Expert, software, software project, technology, Tips&Tricks, tool chains by Erich Styger. Bookmark the permalink. Nice tutorial, really good improvement from the new Processor Expert. I followed, like a monkey, the tutorial and at the beginning I did not had the Target Processor configuration items. This was because on the Project -> Properties -> C/C++ Build -> Tool Chain Editor it was Cross GCC selected and not Cross ARM GCC. Now it’s all good. The code compiles and links but does the bare project code compile without warnings? I have warnings in startup.c. I’m not seeing the Create Flash Image or Print size. Does it have to run? I’m also having as output just an ELF file with the project name and no extension. have you 1) created a PEx project and 2) changed the tool chain? I had this way in my original post, and this leaded to the problems you are reporting. Can you check the latest update of the post where I use 1) create a GNU ARM project and 2) change it to a Processor Expert project? Can you confirm you did it as this? I did anything once again with a new project and now it works. I had at this step: https://mcuoneclipse.files.wordpress.com/2014/01/empty-cross-arm-gcc-project.png the Cross GCC selected. Changing later to Cross ARM GCC seems that is does not fully work. I think I’ll export the current one as template. The thanks really go to Liviu (the maintainer of the GNU ARM Eclipse Plugins). And thanks for finding the problem you had. I make a note in the post, as it is easy to select the wrong tool chain. And changing the tool chain afterwards did not work well for me too. Based on your recommendation I managed to get as far as installation of the GNU ARM cross compiler, Eclipse, the GNU ARM Eclipse plugin and failed on the critical Processor Expert 10.3 eclipse plugin due to a seemingly missing dependency package com.freescale.updater.touchpoint 1.0.0. Some googling about has turned up nothing thus far. It would seem the required package may have been included in PEx 10.2 or earlier and is missing in 10.3. I am running Win8 and will now attempt to install under linux in an effort to rule out Windows. Any thoughts? Has anyone else experienced a similar dependency problem when clean installing PEx10.3? 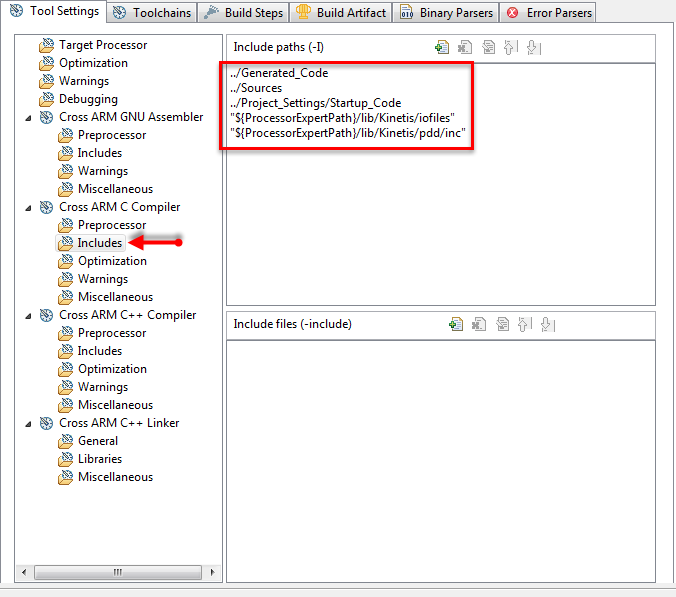 UPDATE: I solved the above issue by first installing com.freescale.eclipse.3.7.updater.custom.updatesite.zip prior to the Processor Expert 10.3 Eclipse plugin installation. I ended up finding a download for com.freescale.eclipse.3.7.updater.custom.updatesite.zip here (https://community.freescale.com/servlet/JiveServlet/download/304336-252686/com.freescale.eclipse.3.7.updater.custom.updatesite.zip). Thanks for that link! That helps until Freescale puts the link to the file on their web site. This helped me too, setting up the latest PE for a student and wasn’t working till i found the updater. Do you have any suggestions how to deal with this problem? I googled and tried different things but I didnt get it to work. I use Ubuntu 16.04.; Kinetis Design Studio 3.2.0 and the KL25Z board. It looks to me like you are somehow using fPU (floating point) instructions which are of course not supported by the KL25Z (which is a Cortex-M0+ without FPU). 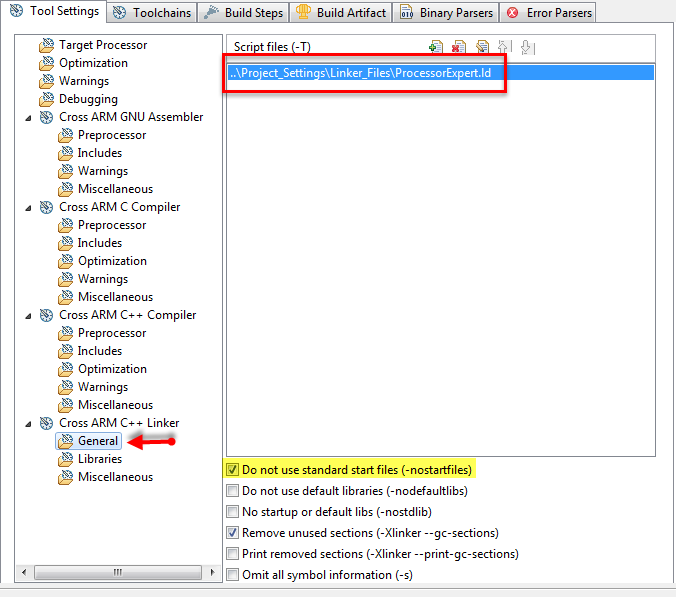 Can you check your project/compiler settings? 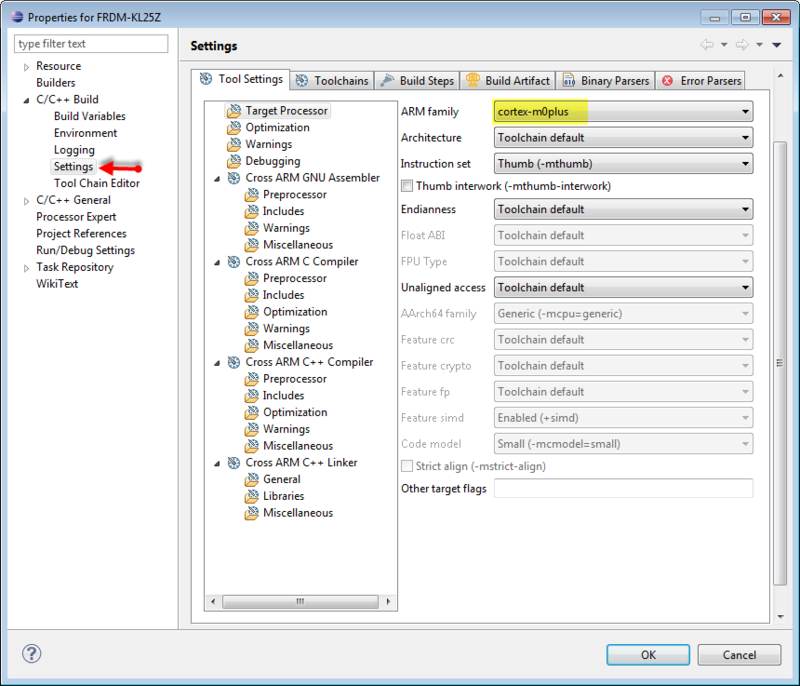 In KDS (Project > Properties > C/C++ build > settings > Tool Settings) the instructions should be set to ‘Thumb (-mthum)), and oll the other settings to ‘Toolchain default’. everything else was grayed out and I was not able to change it. And Float ABI was per default set to “FP instructions(hard)”. I also tried to set “Other target flags” manually but it failed. The solution was to first set in the ARM family field a different processor like cortex-m4 (in this case the Float ABI is not grayed out) and set it to “Toolchain default” then I changed the processor back to cortex-m0plus and tadaa! It worked. Thank you for your very very helpful tutorials and I wish a good evening. ok, then really the “FP instructions(hard)” was the root cause of that problem. How did you create that project? Maybe something is configured in a wrong way in the template for that project. Ah, i think I got my fault. 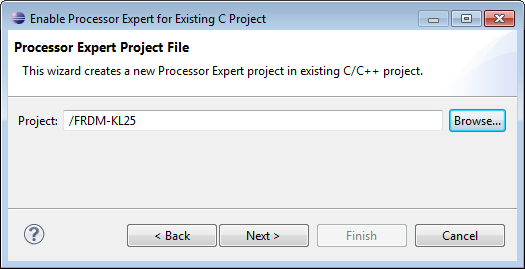 I did everything as mentioned in your Tutorial but when I “Enable Processor Expert for Existing C Project” there is one different step to yours. And everything is selected by default so I didn’t changed it. If I desselect (2),(3),(4) it work as it should.